Text Text : Blah Blah - Blogsite of Cartoonist Sumit Kumar. : The most hilarious comic script I've read! I have been a comic lover since the time I can remember (Just like every other person I guess). It started with Disney comics followed by Diamond comics – Chacha chaudhary, Billoo, etc.. 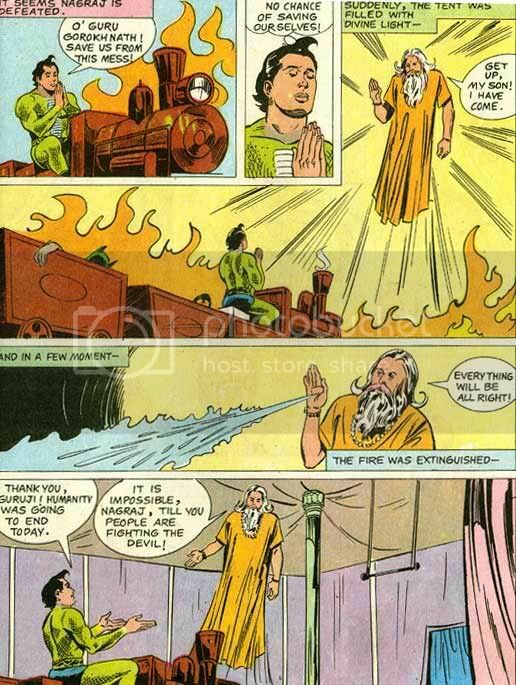 When I was a kid, the whole train journey of two days was spent just by reading comics – Phantom and Tinkle. I have read plenty of funny ones but there is one particular story which is easily the most hilarious one I’ve ever read. And the best thing is it doesn’t try to be funny. It is actually a bit serious. It is about how ‘Nagraj’ saves Earth from a wicked magician ‘Shakoora’. Before heading towards the story, let me introduce the character ‘Nagraj’ if you haven’t heard of him. The superhero’s real name is ‘Raj’ and is based in India. The name ‘Nagraj’ means ‘King of Snakes’. His body contains millions of snakes which he can release whenever he wants to (a bit like spidey and his web) and can make them perform various tasks. He has the ability to transform into a snake. He can use snakes as lasso, disarm enemies by releasing snakes and can make snake-ropes and swing. He can hypnotise, release poisonous breath and his bite is lethal. Oh yes, he can also turn invisible by changing his skin colour. The story starts with the magician Shakoora being punished in his Planet for causing trouble to their inhabitants. But Shakoora makes a protective cover over himself and escapes from his planet. 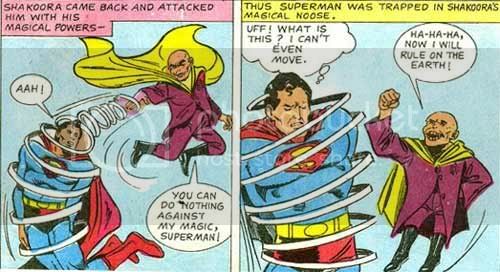 In the earth, Superman MURDERS a villain. I like this ‘uff’. It is typically Indian. Nice to see a villain using it when in trouble. Superman defeated. 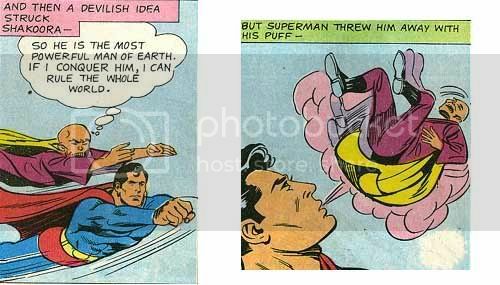 'Puff' goes ‘Uff’. Wow. Superman promotes Nagraj to the league of Batman and Spidey. Batman introduces himself as ‘Bruce Wayne alias Batman’. Nice. That makes things less complicated. 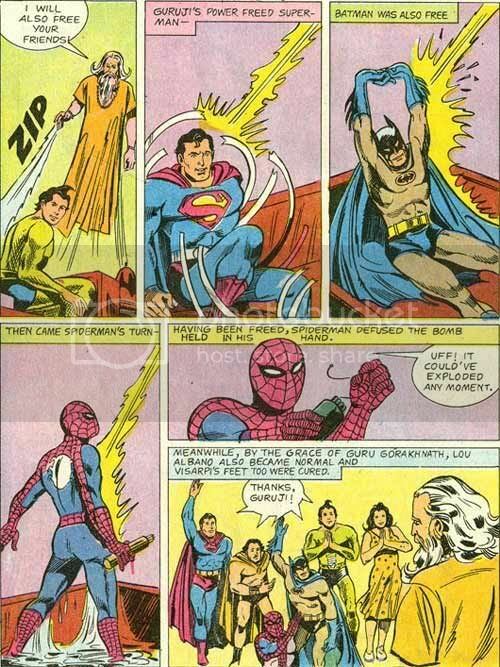 But Batman goes ‘Uff’ too and is defeated. 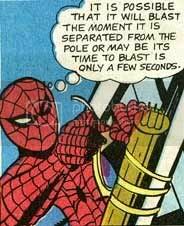 Spiderman is diffusing a bomb on Eiffel Tower. But he too is captured. 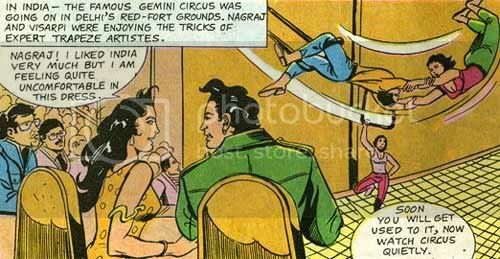 In India, Nagraj and Visarpi are enjoying the circus and complaining about minor things. 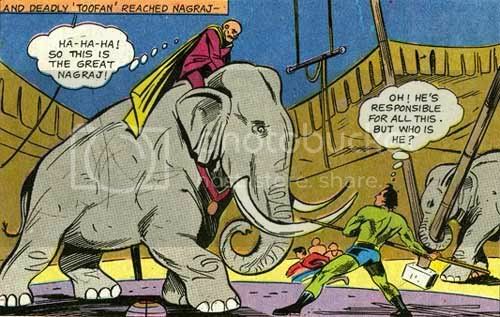 Shakoora takes control of an Elephant and attacks Nagraj. Nagraj was saved by the elephant trainer. Nagraj gives an excuse. Shakoora utters the best dialogue ever written in the history of comics. Nagraj spots the three superheroes unconscious and useless. 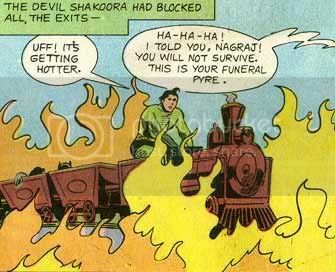 Nagraj grabs the circus train to save the superheroes. He is willing to sacrifice himself. But Superman goes “Dear Nagraj… “. So touching. Nagraj goes “uff” and Shakoora is on great form with his dialogues. What will Nagraj do? Now comes the most ridiculous twist. Divine Intervention. Look at the way Batman wakes up. Oh yeah! 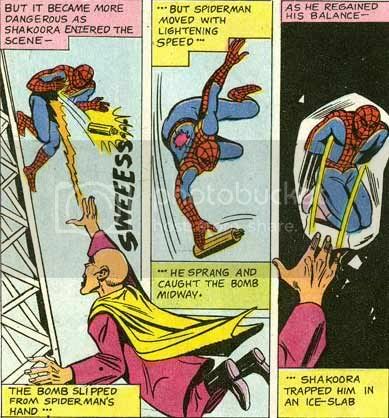 Spidey gets busy diffusing his bomb with an “Uff”. They have dinner together. At Le Meridien. With their costumes. I wonder how Spidey ate.